So, I’ve been nominated for an award! 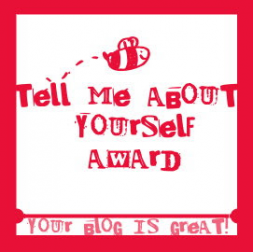 Thank you Corinna from Cooking with Corinna for nominating me for this award – I really enjoy reading her food blog so please check it out for some delicious and easy home cooked recipes. My favourite music is jazz. If you ever lose me, just head to your nearest Chanel counter. It’s only a matter of time until I return to the mothership. I’m 42-30-42 (on a good day). I enjoy knitting-I’m currently working on a green cardigan. I always carry polo mints in my handbag. You never know when you might need to make friends with a horse. I hate having wet feet. What a surprise! And thank you so much! 😀 It’s my pleasure! Hope you enjoy it – I found it a lot of fun!